Smartphones lack the ability to add a fisheye,wide-angle,or a macro look to the Photos which spoils the quality and feel of the photos. Android phones do capture beautiful images but still artificial distorting is needed. Instead external , universal lenses enables the android phones to shoot an image in a creative way. Attaching the lens makes it posible to click wonderful shots from your smartphones. The lens comes with the common three pieces — fisheye, wide-angle, and macro — and works by clipping on to secure over your Android phone's camera. This comes with a tiny godzilla monster on it while the lenses are bright red in colour. 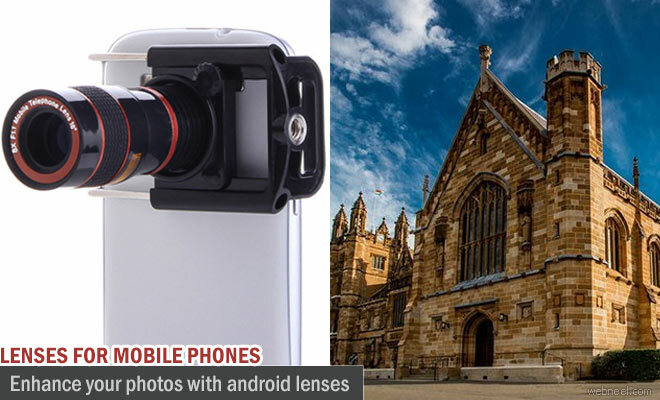 These lens attach quickly to the phone and enable a lot of creativity to your photography. The lenses are made from a durable aluminium material, so if it slips accidentally also it won't break. The lenses are also considerably thick. Aukey Ora lens is equipped with a 120-degree wide angle lens and a 15x, high definition macro lens. The 15x macreo lens enables you to capture even the finest of your subject's details with crystal-clear clarity.